We were so happy to be back with you all for another LIVE Broadcast!! This month we had SO MANY announcements! We had a few new policies, the grooms’s suite, a new partnership, and a new face to introduce you to! Dana also schooled Maggie majorly in some wedding trivia. Make sure you check it out. This Month we Met Ashlee with Bushel and Peck Designs! We both got schooled in some flower trivia and shared our favorite things for this month! We are SO sad that we were unable to save October’s Broadcast!! We frantically realized that we never hit the infamous Save button and could do nothing to get it back as it expired -eek! We had a great time though chatting about Bradford updates: New Mulch, We are hosting a Pop-up Market December 1st, and we had two great features- one on Grey Likes and one on Vision Events Blog. 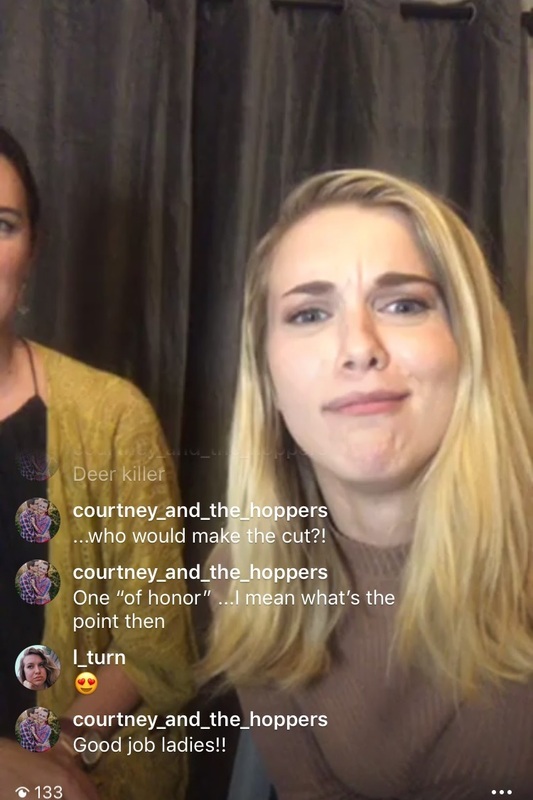 Maggie totally schooled Dana in the dress game - I mean it was brutal :) All we have is this really awesome screen grab and I think it pretty much sums up the broadcast! This is the first Newsletter we did! We chatted about the summer projects we finished, weddings we loved this past month, and weddings we are excited to celebrate! Also watch Maggie totally kill the Bridal Trend game. Thanks for tuning in! And sorry it is sideways! !